Jay is one of the brightest talents on the Australian music scene. Originally from Perth, this entertainer has had many years of experience in numerous opera and theatre productions nationally and internationally. Discovering an early passion for music, he began playing the keyboard at ten and at thirteen was awarded a musical scholarship, commencing training at Perth Modern School. He continued his studies and went on to complete a Bachelor of Music (Classical) at the West Australian Academy of Performing Arts (WAAPA). Having studied for a further year, he was awarded a Post Graduate Diploma in Opera Performance, including the Academic Award of Excellence from Queensland Conservatorium of Music. Jay is a tenor capable of a wide variety of styles, including Opera, Musical Theatre, classical and contemporary music. Previous performances include the Mikado with the Queensland Opera Company, Lohengrin with the Australian Opera Company at the Sydney Opera House and various productions with the Brisbane Conservatorium of Music. He has been contracted to appear at many high profile venues nationally, including Conrad Jupiter’s Casino on the Gold Coast, Perth Convention Centre, Perth Concert Hall and the opening ceremony for the Western Force at Subiaco Oval to a crowd of some 35,000 fans. 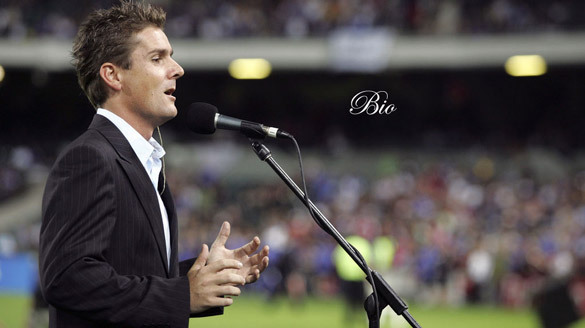 More recently Jay performed at the final Western Force home game at Subiaco Oval before a similarly appreciative crowd. He has had numerous television appearances including Telethon for the past three years and sang the Telethon 2005 closing ceremony. He has also enjoyed considerable radio airplay. Jay has been contracted to entertain on the prestigious Silver Sea and Princess Cruise Liners, including cruises to South East Asian destinations, New Zealand, The Middle East and Australian ports as well as an occasional Cruise to The Mediterranean and Europe. He is an accomplished pianist, arranging and performing his own accompaniment on his keyboards. All the musical arrangements for his CDs were performed and produced by Jay.